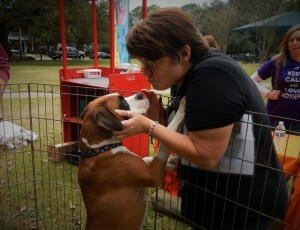 At Louisiana Boxer Rescue, we aim to place rescued boxers in loving, forever homes. But from the time we pull them from a shelter or other situation and find homes for them, we need help housing them. By fostering a rescued boxer, you know that you are providing a loving bridge between rescue and permanent home. All vetting expenses are covered by LBR. Being a foster mom and fundraising are some of the most rewarding things in my life!! Fostering provides a loving and safe stepping stone to a forever home. Yes, it can be hard because I do get attached but in my heart I know I’m not their forever home. Saving lives is what matters!! Bringing a dog into my home means a spot opens up in a shelter and potentially saves another life. The wins matter!! I encourage anyone who can open their heart, and their home, to foster a pet who has been abused, neglected, or thrown away. The rescue group provides food and medical care. You provide a safe, loving home. Trust me, your heart will be filled with happiness and your life filled with purpose and meaning beyond compare! If you are interested in becoming a foster with LBR, please fill out this application.